The farmers brought the cut hay to the „Schupfe“ (a small hut) or they formed a so-called “Triste”. A “Triste” is a cone-shaped haystack, consisting of a bar where the hay was put around. Then the farmers stepped on it in order to form a solid structure. The ground was covered with “Taasn” (spruce branches) to protect from ground humidity. The top was covered with barks. When winter has come, the farmers brought the hay down to the valley. On the day before the hay should have been brought to the valley a “Riese” was shovelled. All farmers, who had to use this trail for bringing their hay down, helped building it. They took this opportunity to bring a small but broad hay cartload at home and to smooth the trail properly. The usually following night frost turned the “Riese”, which was bad and soft in the beginning, into a good and solid road, allowing a quick descent during the following days, as long as the weather remained cold. Haymaking in steep mountain meadows. 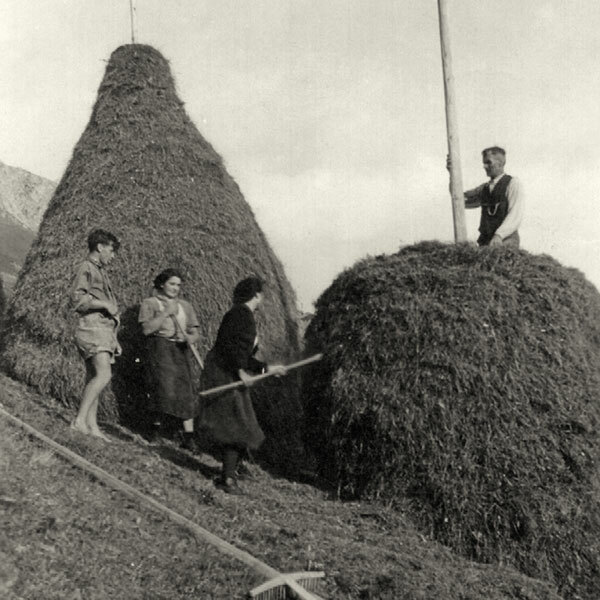 The hay was carried on the back to the next “Schupfn” (small hut). 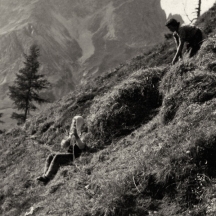 Making hay stimulates the appetite – a deserved rest with a hearty meal in steep meadows. A “Triste” is a cone-shaped haystack, consisting of a bar where the hay was put around. Then the farmers stepped on it in order to form a solid structure. The ground was covered with “Taasn” (spruce branches) to protect from ground humidity. After a hearty meal the first hay workmen headed for the alpine meadows at about midnight, so that they could start their work by dawn. 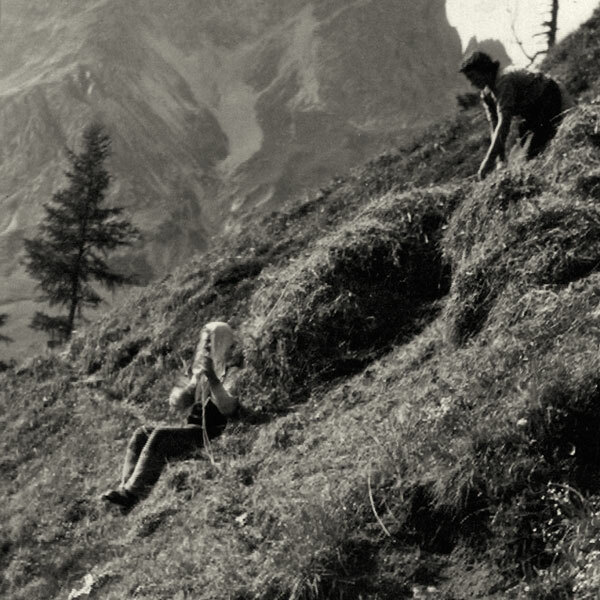 They took along the so-called “Ferggeln” (small sleighs to pull the hay), scoops, chains, a small hayfork, a short rake, a small hand axe and two “Schlafen” (ski-like timbers used to carry hay). A rucksack with a snack and some nails were also indispensable. Hand axe and nails were required in case a “Ferggel” needed to be repaired. “Our first rest was at Klammtröglilan”, says Hans Egartner, “when we heard a gentle swoosh we knew that we could take our time, because there was wind up there.” With strong wind it was impossible to build a solid cartload. “Usually the wind ceased after sunrise”, knows Egartner. As soon as the workmen arrived at the hut, a square of about 6 to 6 metres was shovelled – the so-called “Faßstatt”, where the hay was loaded on the cart. It was not easy to build a smoothly running and stable hay cartload. At least 4 persons were needed for this work. One of them forked the hay on the cartload. One person stands before and one behind the cartload and cared for the regular and solid structure. The fourth person went around the cartload and removed the overlaying hay using a small rake. After all “Fiedolan” were ready, the hay was brought down to the valley, where the waggoners already waited to load the cart on the sleigh. By noon the hay was already in the barn and could be downloaded before lunch. 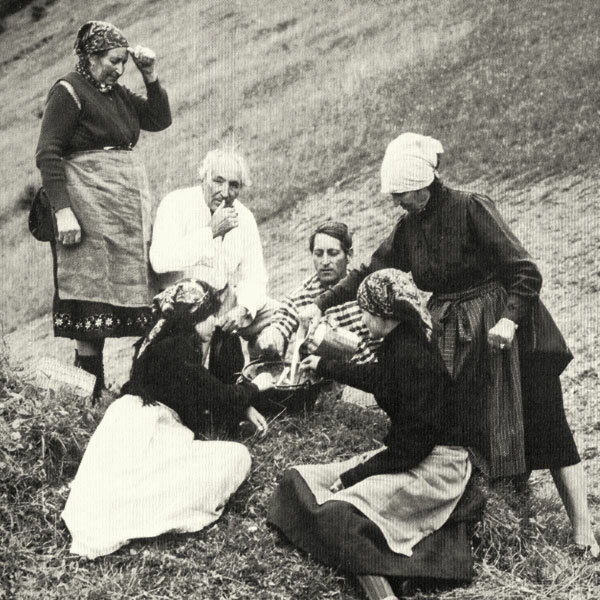 The usual meal for the workmen was composed of regional specialties like “Schottsuppe”, “kloazana” and “ruabana Krapfen” served with milk, but also dumplings and goulash. This work was repeated every day, until the hay of every farmer had been brought to the valley. 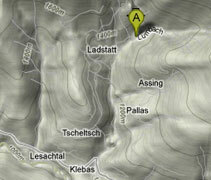 Wood was the only wealth of Lesachtal valley farmers, which is why they handled it very economically. They made use of it only when they urgently needed money. Lesachtal valley floaters - Up to the 1960s, whenever the farmers wanted to bring their timber to a sawmill, they had to face the dangerous and hard work of “timber floating”. Only in autumn the logs will be brought to the road using a chute or in winter by carriage. Tree cutting - Before the motor saw was used, all works were carried out with ancient tools, which had been used for centuries. 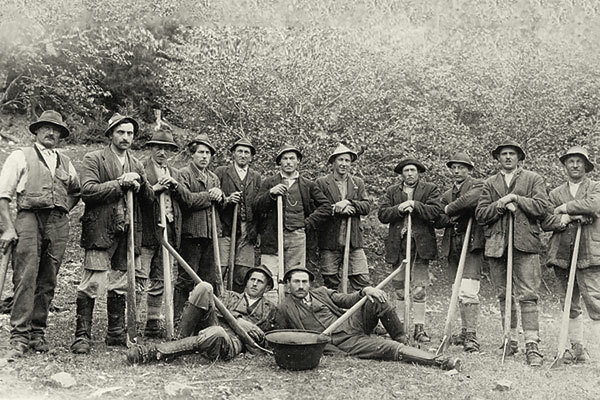 Among those were the pit saw, the “Tschindra” (used for limbing), the branch axe or long axe, the “Schepsa” (to decorticate the trees), various wedges and the pickaroon. Once the lay is determined the tree is felled. Along with the direction of the fall a wedge cut is made, the back cut, which cuts the tree down, is made on the opposing side. 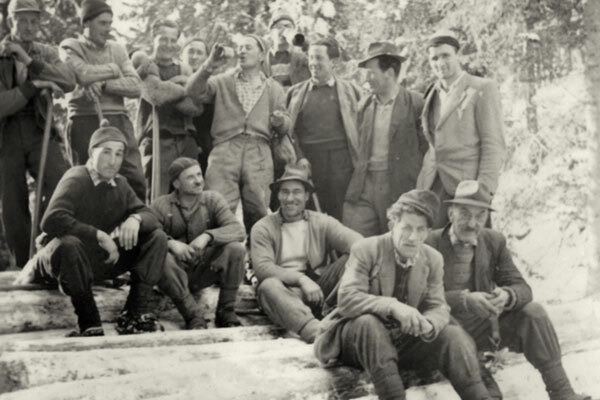 After limbing and decortication the so-called “Feldan” may start, also known as skidding (pulling the logs out of the forest). 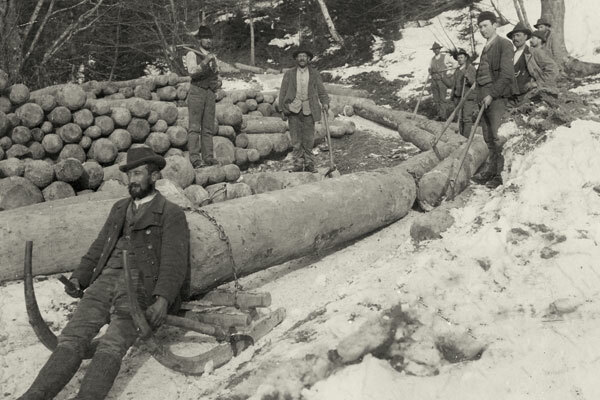 The lumberjacks will look for a landing place to store the logs for transportation. Log chuting – The so-called “Plangge” (chute), used as a slide for the logs, had already been built in summer. It is composed of smaller sticks on the ground and larger ones on the sides. When the “Plangge” is wet and icy enough, log chuting is possible. Timber floating - Up to the 1960s, whenever the farmers wanted to bring their timber to a sawmill, they had to face the dangerous and hard work of “timber floating”. The natural character of Lesachtal valley, presenting deep gorges cut by Gail river and its feeders, made log floating especially advantageous. With favourable water level up to 1000 4 metres long logs were floated at a time. The floaters’ equipment and clothing was composed of a short pair of trousers, long underpants, roughly nailed shoes, spurs and a pickaroon. On the floating trail along Gail river the floaters were accompanied by persons, who carried their rucksacks containing dry clothes and a snack. They often had to carry the cookware too, so that they could prepare a hot meal once a day for the floaters.